Thanks for buying Brand X Huaraches. Please try them on around the carpet. If you are not satisfied for any reason, simply return them within 60 days for exchange or refund. Be sure to enclose a little note with your instructions. Refer to your order number. Brand X Huaraches 4228 Telegraph Ave. Oakland, CA 94609. We recommend the U.S Postal Service. Please EMAIL your tracking # to us. Questions? 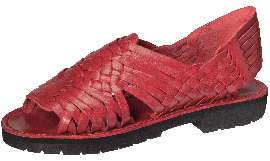 Visit us at brandxhuaraches.com where you can shop for more by clicking on SHOP NOW! ; read customer reviews; see how Huaraches are made and contact us. The Best Huaraches on Earth!